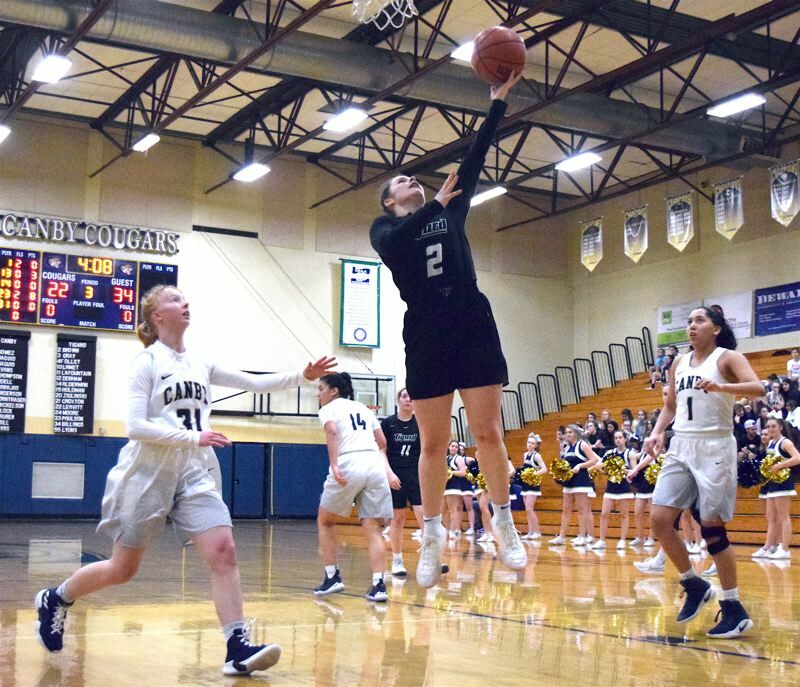 CANBY — The Tigard High School girls basketball team swept through all the competition during the first half of Three Rivers League play. The Tigers look to be in fine form as they head into the back half of league action. 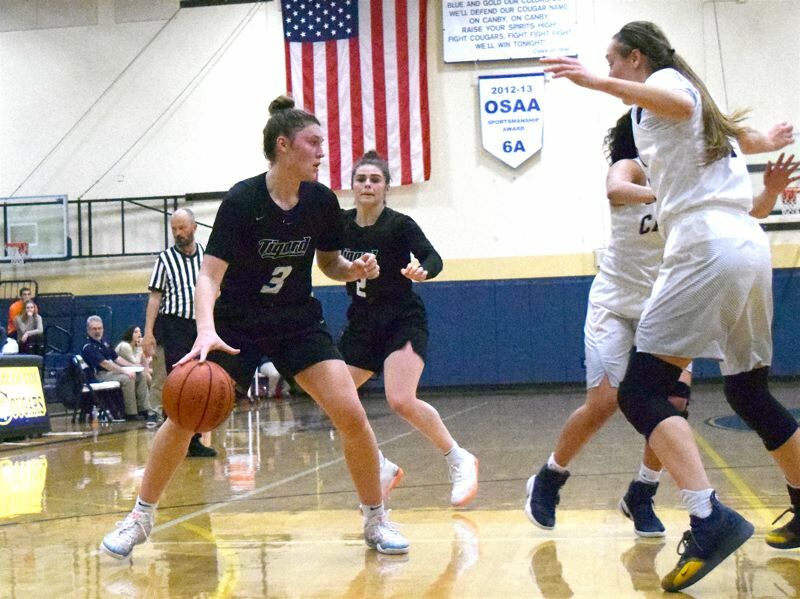 Headed into hostile territory against Canby, Tigard stayed unbeaten in league play, getting a 50-39 win over the Cougars in a game played Friday at Canby High School. "They were playing great defense, and we weren't getting easy looks," Tigard coach Steve Naylor said. "We finally made a couple shots and made a little run there and got into halftime in the lead." With the loss, Canby moved to 3-5 in TRL play (7-12 overall), putting the Cougars in a tie with Lakeridge and Tualatin for fourth place in the league standings. Tigard improved to 8-0 in TRL games (17-2 overall), keeping the Tigers perfect, and in first place, in the league standings. Canby, on Friday, did not make it easy on the top team in the Three Rivers League though. The Cougars started the game with a strong offensive effort due in large part from the efforts of Nicole Mickelson. The 6-foot Canby junior scored the first three field goals for the home team, and tacked on a pair of baskets from the free throw line. Freshman Joey Baguio made her presence felt as well, picking up a steal, a basket, and going 1-of-2 from the from the charity stripe. Tigard managed eight points in the quarter, with seven of those points courtesy of senior Campbell Gray. At the end of the first quarter, Canby led the away team 11-8. In the second quarter Canby stretched the lead to nine points with a pair of 3-pointers from Baguio and senior Amanda Davis. From there though, Tigard put the pedal to the floor. Gray scored seven straight points, including converting on an and-one play to shorten the deficit to just three. Minutes later Canby grabbed three points to keep the lead at 20-18, but Tigard continued to force the issue. Particularly important, the Tigers defensive press forced a numbers of turnovers and easy baskets in the paint. Late in the first half, Tigard went on a 10-0 run that included a pair of baskets from Gray inside the paint, and 3-pointers from junior Delaney Leavitt and senior Paige LaFountain. "Anytime you play a team for a second time in league you know they're going to bring it," Gray said about the competition. "You know they've adjusted to stuff you've run before. You have to turn it up, and we were excited to play them. We knew they were going to bring a good game." At the halftime buzzer, Canby trailed Tigard 28-20. Coming into the third quarter Canby's deficit grew right off the bat as the Tigers went on a 6-2 run, but it would not grow any more than that. Junior Ally Odell scored 8 points in the third quarter, and junior Arika Evans dropped a basket from beyond the arc to make things 36-31 late in the quarter. Canby closed the gap further thanks to a Baguio 3-pointer right at the buzzer, and the Cougars trailed by just 2 points. Tigard led 36-34 heading into the fourth. The Tigers proved why they are among the top teams in the state by starting off the final quarter of play with a 9-2 run. Conversely, Tigard's stifling defense held the home team to just five points in the final quarter. At the end of the game Canby was down 50-39. A big part of Tigard's success offensively came thanks to Gray, who recorded 29 points overall. The next closest scorer was LaFountain with seven points. The defensive press was also what disrupted Canby's offense in the second quarter and established that initial eight-point lead. "I would say I'm pretty comfortable out there," Gray said. "I've been playing with these girls a long time. We know our style of play, we know what our tendencies are, and I think that helps us out offensively and playing with each other." Junior Kennedy Brown added six points for the Tigers and Leavitt and sophomore Ajae Holdman each scored three. The Tigers' scheduled home game with West Linn on Tuesday was postponed until Wednesday, where it will have a 7 p.m. start. On Friday, Tigard will host St. Mary's Academy at 7 p.m.